Rabanus Maurus Magnentius (c. 780 – 4 February 856), also known as Hrabanus or Rhabanus, was a Frankish Benedictine monk and theologian who became archbishop of Mainz in Germany. He was the author of the encyclopaedia De rerum naturis ("On the Natures of Things"). He also wrote treatises on education and grammar and commentaries on the Bible. 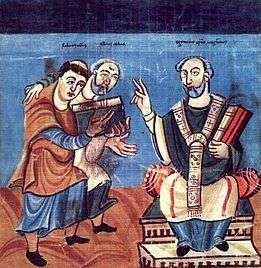 He was one of the most prominent teachers and writers of the Carolingian age, and was called "Praeceptor Germaniae," or "the teacher of Germany." In the most recent edition of the Roman Martyrology (Martyrologium Romanum, 2004, pp. 133), his feast is given as February 4th and he is qualified as a Saint ('sanctus'). Rabanus was born of noble parents in Mainz. The date of his birth remains uncertain, but in 801 he received was ordained a deacon at Benedictine Abbey of Fulda in Hesse, where he had been sent to school and had become a monk. At the insistence of Ratgar, his abbot, he went together with Haimon (later of Halberstadt) to complete his studies at Tours. There he studied under Alcuin, who in recognition of his diligence and purity gave him the surname of Maurus, after the favourite disciple of Benedict, Saint Maurus. In 814 Rabanus was ordained a priest. Shortly afterwards, apparently on account of disagreement with Abbot Ratgar, he withdrew for a time from Fulda. This banishment has long been understood to have occasioned a pilgrimage to Palestine, based on an allusion in his commentary on Joshua. However, the passage in question is taken from Origen's Homily xiv In Librum Jesu Nave. Hence, it was Origen, not Rabanus, who visited Palestine. Rabanus returned to Fulda in 817 on the election of a new abbot, Eigil, and at (Eigil's death in 822, Rabanus himself became abbot. He handled this position efficiently and successfully, but in 842 he resigned so as to have greater leisure for study and prayer, retiring to the neighbouring monastery of St Petersberg. 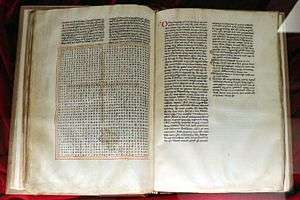 Rabanus' works, many of which remain unpublished, comprise commentaries on scripture (Genesis to Judges, Ruth, Kings, Chronicles, Judith, Esther, Canticles, Proverbs, Wisdom, Sirach, Jeremiah, Lamentations, Ezekiel, Maccabees, Matthew, the Epistles of St Paul, including Hebrews); and various treatises relating to doctrinal and practical subjects, including more than one series of homilies. In De institutione clericorum he brought into prominence the views of Augustine and Gregory the Great as to the training which was requisite for a right discharge of the clerical function. One of his most popular and enduring works is a spectacular collection of poems centered on the cross, called De laudibus sanctae crucis, a set of highly sophisticated poems that present the cross (and, in the last poem, Rabanus himself kneeling before it) in word and image, even in numbers. ↑ No. 282 in The Hymnal 1982, Church Publishing Incorporated, New York. ↑ Newly edited by Detlev Zimpel, see bibliography. ↑ Aaij, Michel (May 2009). "Continental Business: Rabanus Maurus, the Preaceptor Germaniae, on the 1150th Anniversary of his Death". The Heroic Age (12). ISSN 1526-1867. Retrieved 30 April 2010.